A near-miss between a drone and a Lufthansa aircraft landing at Los Angeles International Airport may give impetus to moves to regulate consumer drones more closely, including by using technologies like geofencing. “This is one more incident that could have brought down an airliner, and it’s completely unacceptable. A near-miss of 200 feet should serve as a stark reminder of the dangers posed by reckless drone use,” said Senator Dianne Feinstein, a Democrat from California, in a statement. The senator said the Senate must pass legislation she introduced last year, called the Consumer Drone Safety Act, which would require safety features for consumer drones and strengthen the federal laws that govern their operation. The bill would, among other things, direct the Federal Aviation Administration to require safety features for newly manufactured consumer drones, such as geofencing to govern the altitude and location of flights and collision-avoidance software. The provisions in the legislation were incorporated into the FAA reauthorization bill, which is expected to be debated on the Senate floor next month, Feinstein added. Geofencing of drones uses GPS and other technology to impose geographical limits on their movement. A Lufthansa A380 pilot reported that on Friday a drone passed approximately 200 feet over the aircraft while it was at 5,000 feet altitude at around 1:30 p.m., FAA spokesman Ian Gregor said via email. The agency immediately notified the air support division of the Los Angeles Police Department about the crew’s report. LAPD could not be immediately contacted for information on the search for the drone and its operator. Pilot reports of drones, also referred to as Unmanned Aircraft Systems (UAS), picked up from 238 sightings throughout 2014 to over 650 in a little over seven months of last year, the FAA said in August last year. People using drones for recreational purposes are required to fly their unmanned aircraft, which cannot weigh more than 55 pounds (25 kilograms), at below 400 feet (about 122 meters), within visual sight of the operator and 5 miles (8 kilometers) away from airports. Comparing the increase in drones to an increase in the bird population, a study concluded that the risk to the airspace caused by small drones, such as those weighing up to 2 kg or about 4.4 pounds, flying in solitary formation is minimal. "Compared to the enormous population of birds, damaging bird strikes are rare," according to two researchers from George Mason University. 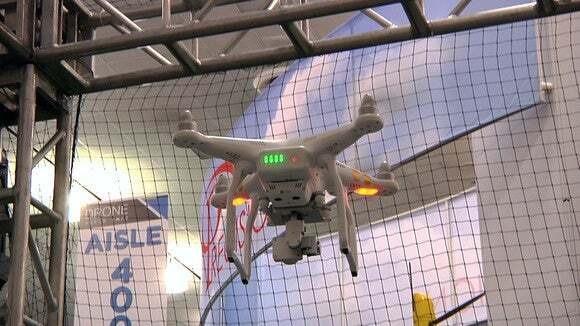 The FAA has as yet to finalize rules for the commercial use of drones as it tries to integrate unmanned aircraft into the national airspace. It has introduced some educational, regulatory and safety measures such as a mandatory register for drones weighing more than 250 grams that it rolled out in December, the Know Before You Fly and No Drone Zone campaigns, and the B4UFLY smart phone app, which tells a drone pilot whether it's safe to fly in their current or planned locations.